The DUALSHOCK®4 USB wireless adaptor makes Remote Play on your computer even better, allowing you to. Guide, gesture and draw with the responsive touch pad - now restyled so you can see your light bar colour from. Connectivity Technology Wireless. Wireless Technology Bluetooth. Touchpad with gesture support. Intense vibration motors. Vibration: Yes. Colour: White. LED light bar. Other features: Built-in motion sensors. Connectivity Technology Wireless. Wireless Technology Bluetooth. Color: Gold. The DUALSHOCK 4 USB wireless adaptor makes Remote Play on your computer even better, allowing you to play wirelessly. The Green Camouflage Dualshock 4 will be joined by the recently announced new Gold and Silver editions in January, so you can start the New Year in style. 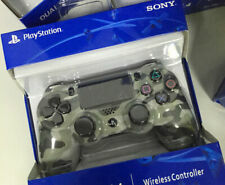 4.5 out of 5 stars - Sony Official Dualshock 4 Controller (GREEN CAMO) (PS4) Brand New & Sealed SALE! 66 product ratings66 product ratings - Sony Official Dualshock 4 Controller (GREEN CAMO) (PS4) Brand New & Sealed SALE! (Built-in with colorful LEDs indicating joystick channels for players, different LED color indicates different joystick. B. Joystick colorful LED indication explain: Display player status. 1) Low power indication: When a joystick battery power is over 3.6V, the joystick LED indicator is solid bright; when the power is at 3.3-3.6V, the indicator would blink at 2.5Hz frequency; when the power is lower than 3.3V, the joystick would be in sleep state. 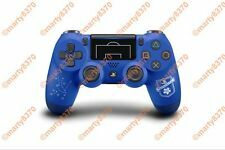 Players can choose to play wirelessly using a Bluetooth connection or by using a USB cable connected to the PlayStation 4 console. Connection: USB Cable. 1 x USB Cable. The button in the middle of the handle can only be pressed and there is no touch function. 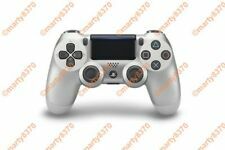 ModelPlayStation DualShock 4. FRANCE: AM2:00~AM10:00. UNITED STATES: PM7:00~AM3:00. Our Working schedule Our prices are reasonable after being carefully calculated. (Orders must be made before 1145GMT). Feel the action - Not only will you see and hear everything in even deeper detail, you'll feel it too with more intense vibration motors. Modified ItemNo. Our prices are reasonable after being carefully calculated. 4 out of 5 stars - PLAYSTATION DUALSHOCK 4 PS4 CONTROLLER MICRO USB CHARGER LEAD CABLE. 51 product ratings51 product ratings - PLAYSTATION DUALSHOCK 4 PS4 CONTROLLER MICRO USB CHARGER LEAD CABLE. 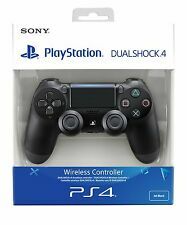 Sony CUH-ZCT2E Dualshock 4 V2 Gamepad for Sony PlayStation 4 - Black. Condition is Used. Dispatched with Royal Mail 1st Class. Platform Supported PlayStation 4. Connectivity Technology Wireless. Wireless Technology Bluetooth. Color: Steel Black. Wireless Technology Bluetooth. Connectivity Technology Wireless. Color: Black.